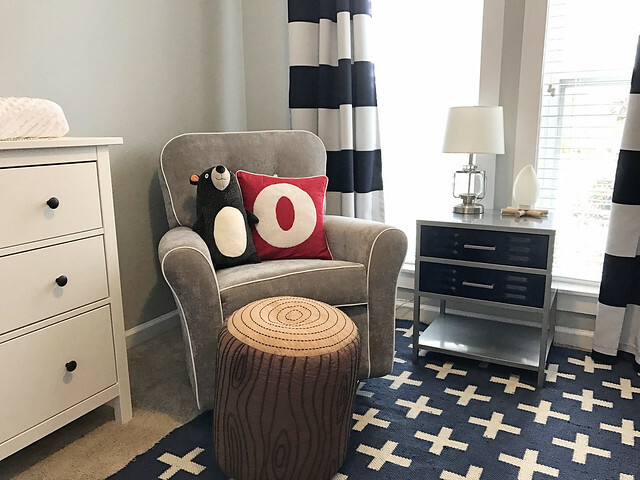 Baby Oliver's nursery has quickly become one of my absolute favorite rooms in our new house. 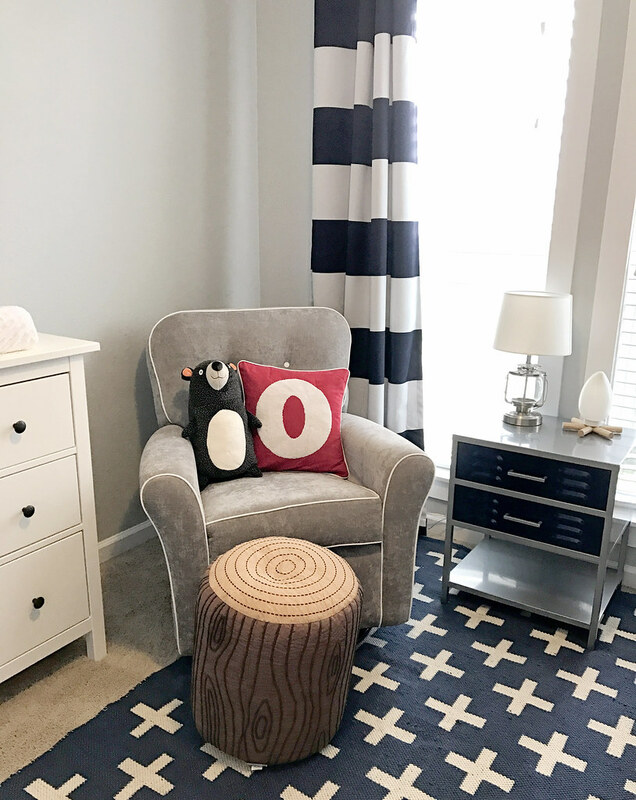 I love the bold, graphic prints, hints of woodland whimsy - and thanks to the gray walls - the room can grow with him as he goes from baby to toddler and so on. 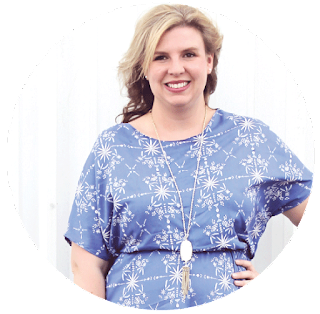 Back in July I created a room inspiration board, which was immeasurably helpful as I collected items for the room. 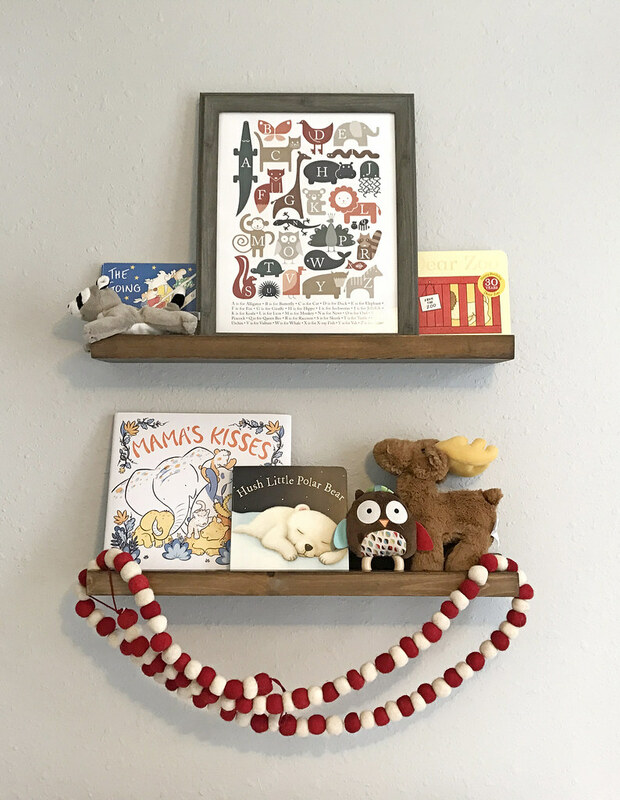 I had a good idea of what I wanted, so I didn't just grab things willy-nilly (like I did for my daughter's nursery). 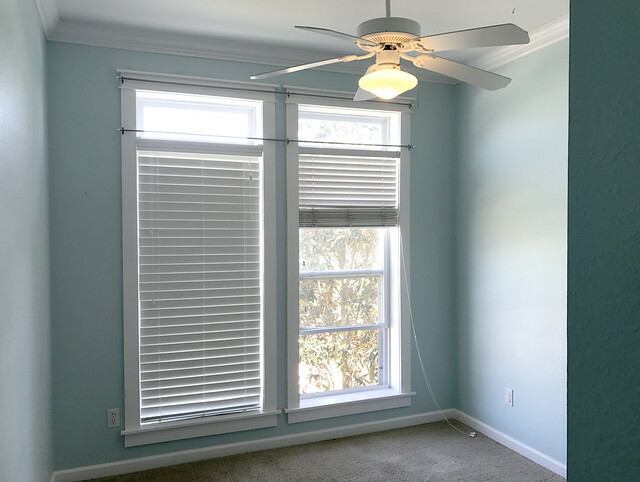 One of the things that surprised me the most while putting this room together is how small the space really is. I knew it was a tiny room, but once we put the rocking chair, dresser and crib in there, it was pretty tight. But, in all honesty, I love how cozy the room turned out! 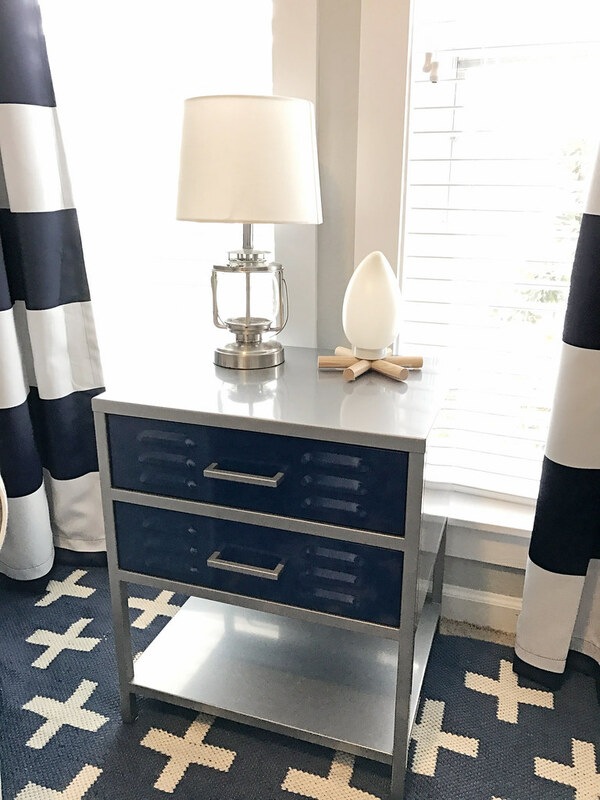 We (and by we, I mean my husband) started the process by covering the baby blue walls with Benjamin Moore's Stonington Gray. 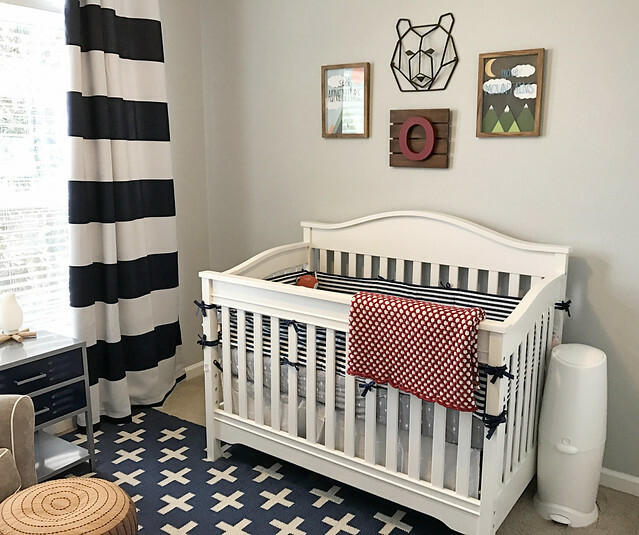 I used a mixture of hand me downs from Big Sister (like the crib and glider), homemade items, gifts as well as a mix of bargain finds and splurges to pull the room together. 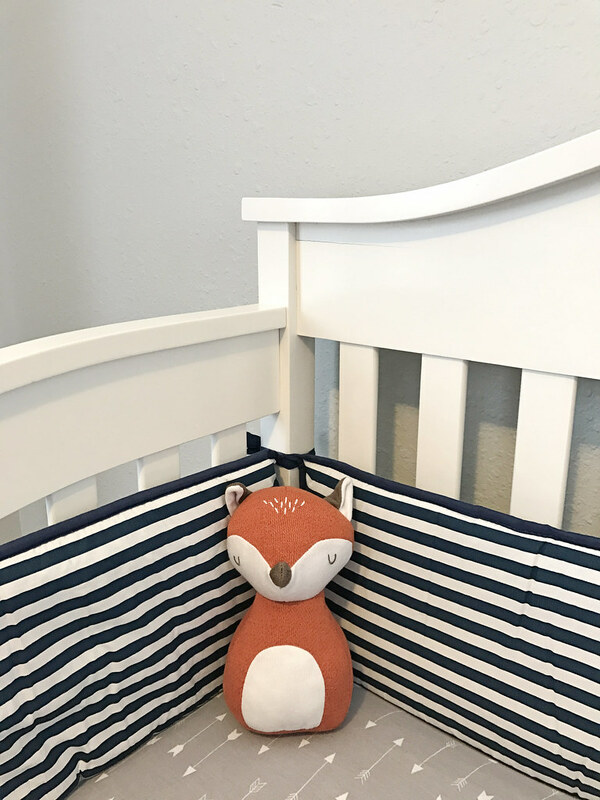 The biggest DIY was this red and white polka crib blanket, which I barely finished in time for his arrival. I was knitting frantically until the end (as in the weekend before he arrived). It was way more time intensive than I thought it would be, but I'm super pleased with how it turned out. I used Hobby Lobby's I Love This Cotton yarn in cream and burnt sienna, and is soft with a good weight. The pattern is for a pram blanket, so I doubled it to make it large enough for the crib. You can find the knitted pattern here, or I found this similar version that also comes in black and white. One of my big splurges was on this gorgeous blue and cream plus rug from The Land of Nod. It's labeled as an indoor/outdoor rug, but it's extremely soft and doesn't feel like a traditional coarse outdoor rug. We haven't had time to replace our carpet, so this guy does a great job of covering up a large amount of carpet. Plus (see what I did there?) it really brings the whole room together. 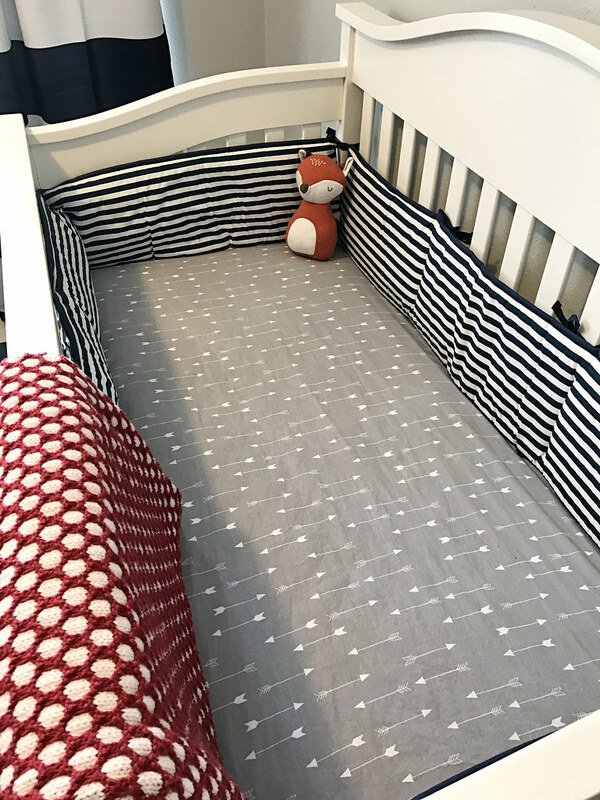 The striped crib bumpers is an Amazon find. 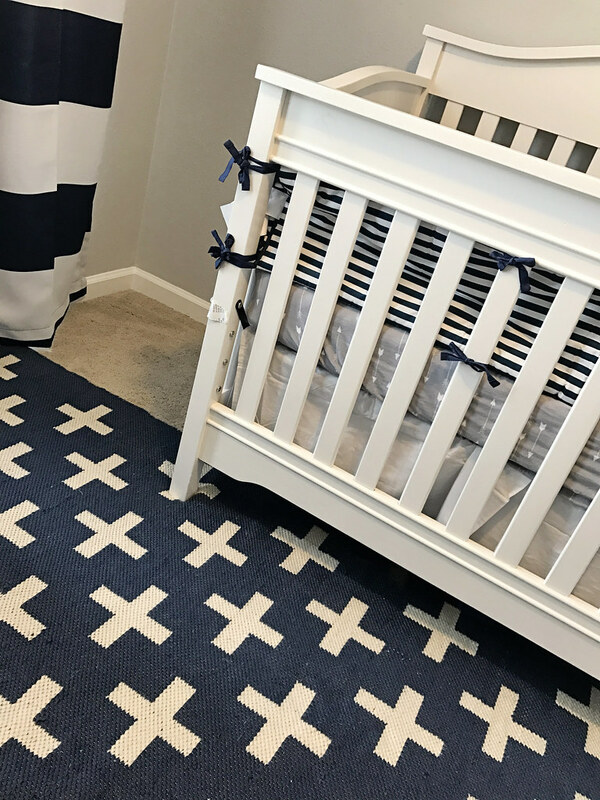 I know crib bumpers are frowned upon because of SIDS, and plan on striping these off the crib once baby boy transitions from his bassinet. We learned with our daughter that little legs (and arms) easily get stuck in the slats. Once he's fully able to roll over both ways (he's mastered a one-way roll) I planning on adding the bumpers back. My parents bought us this IKEA dresser, and it's just perfect for the space.The silver rolling cart is perfect for holding diapers, wipes and lotion. We added some floating shelves to hold books since the room is too tight to add a traditional bookcase. 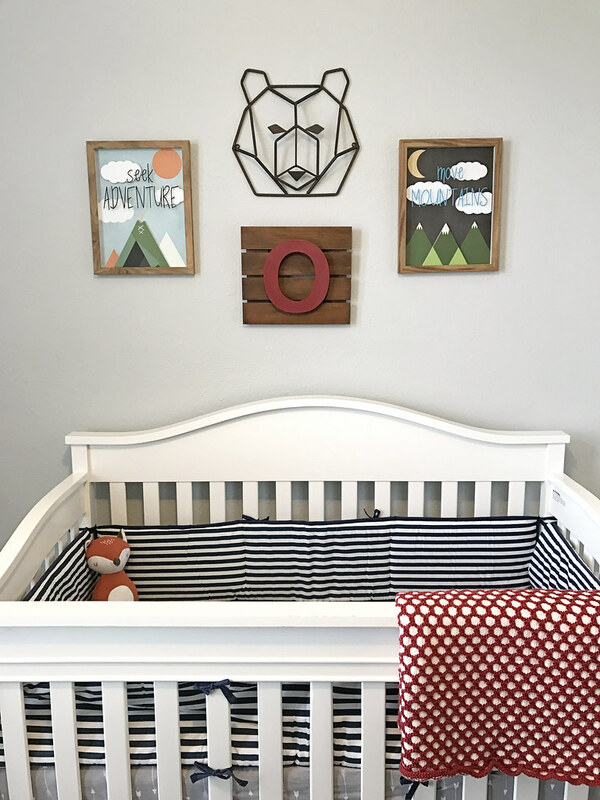 I originally designed this abc print for Big Sister's nursery and modified the colors to coordinate with Oliver's room. My sweet co-workers bought him "Mama's Kisses" complete with personalized dedications. I still can't get over what I good deal I got on this fun locker nightstand. It was on clearance, cartwheel had an additional 20% off clearance offer AND there was the tiny tiniest little chip on the side, so they gave me an addition 20% off. So I basically got an $80 dresser for about $30. I splurged a bit with the campfire nightlight, but didn't feel too guilty about it since I'd saved on the nightstand. It is worth noting that though it's listed as a nightlight, the bulb it comes with is waaaay too bright to be used as such. So I just bought a lower watt bulb - problem solved! 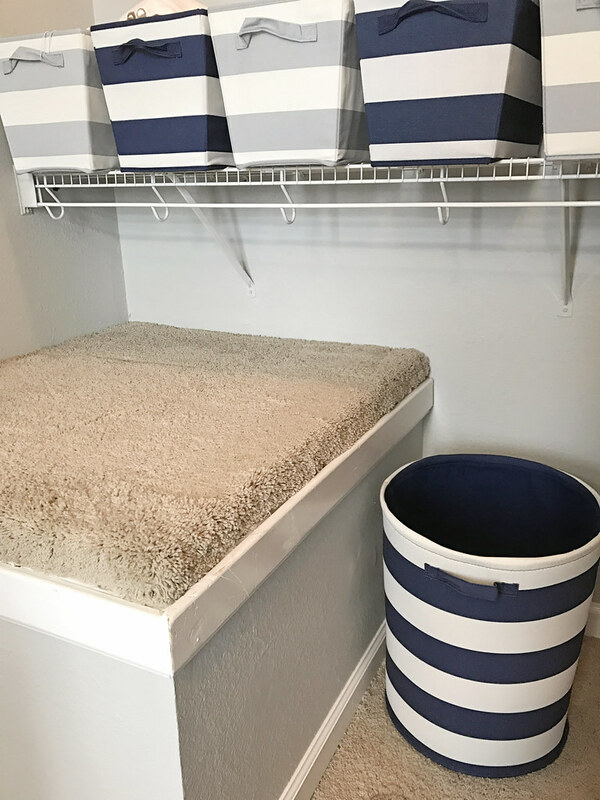 Since Oliver's closet is on the small side, I wanted to maximize storage - especially since most of his clothes are folded in the dresser. 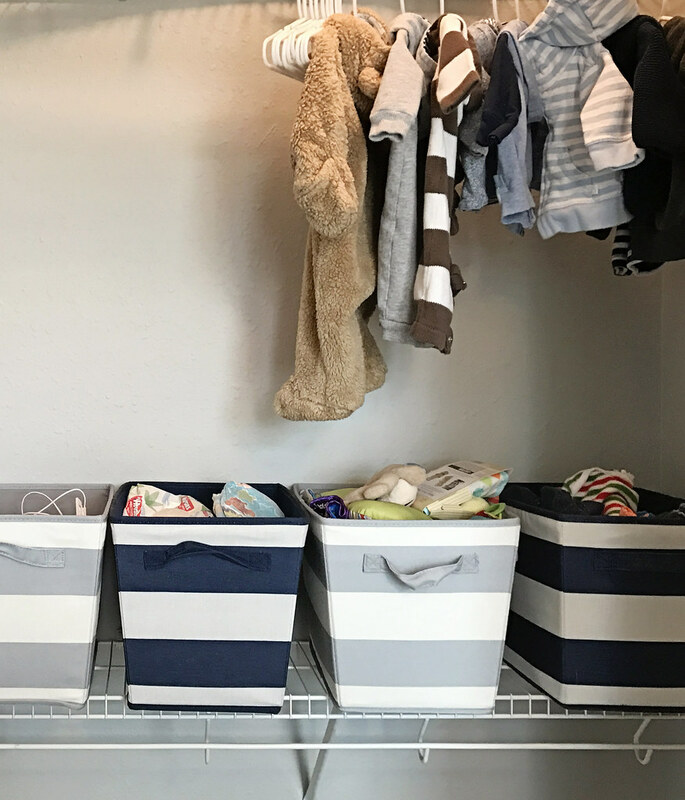 My solution was to stock up on these gray and navy stripe bins. They're perfect for holding toys, extra blankets, wipes and other miscellaneous things. We still have that awkward box (stairway clearance) in the closet, which I'm stumped on what to do with. Thoughts? I played around with a bunch of different ideas for the wall behind the crib - from painted mountains, to retro-styled travel mountain posters - but eventually decided to do a collage. I found the seek adventure framed art at my local Target and it's mountain mate online. 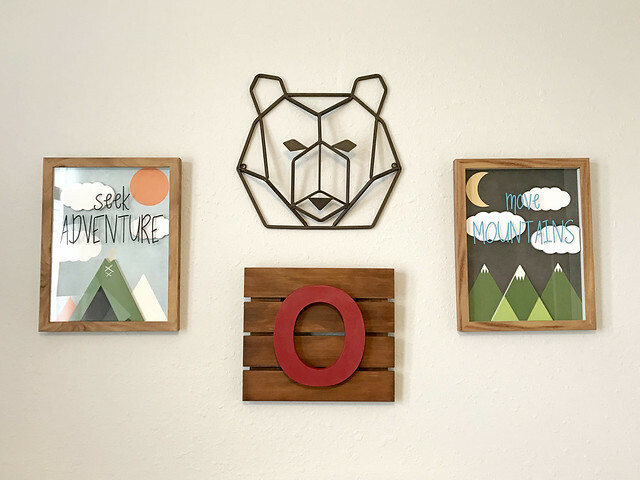 The metal bear head was a Hobby Lobby find and my husband and I made the slatted wood "O" sign. 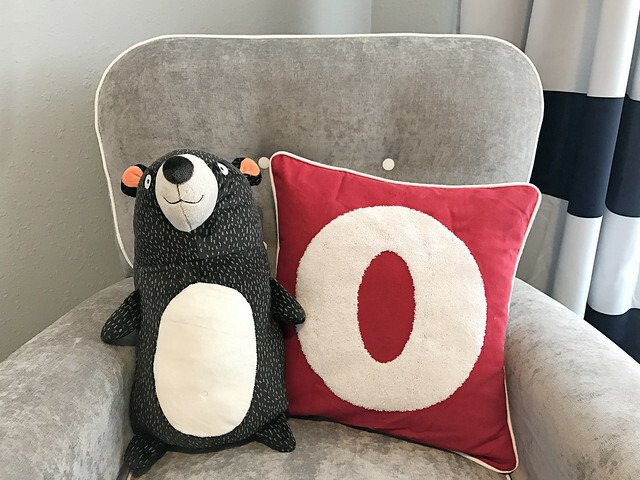 We picked up the slatted sign and wood letter O from Target. I painted the "O" brick red and my husband stained the sign and glued everything together. Easy, peasy. 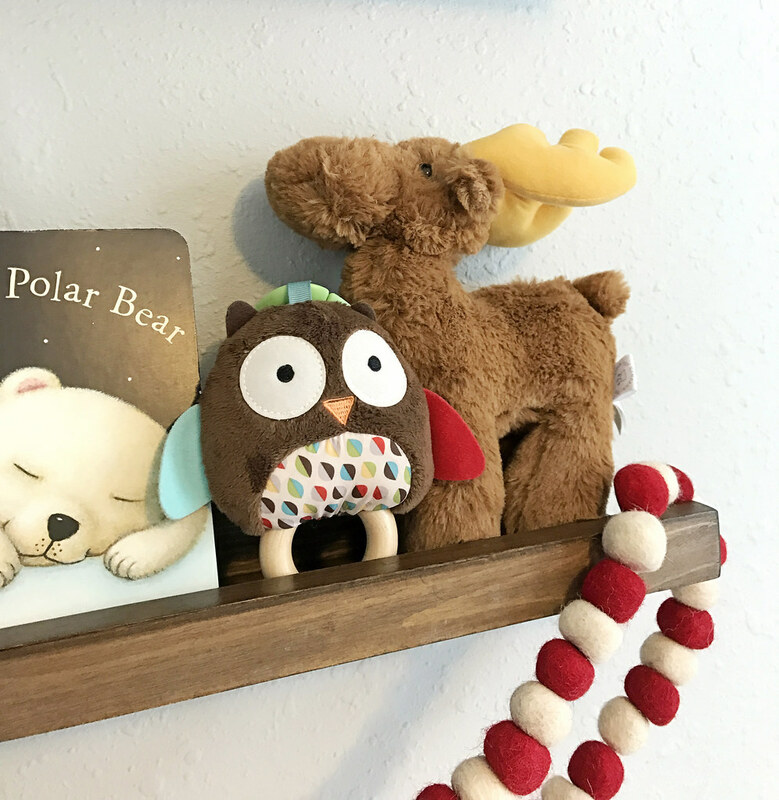 This sweet little stuffed bear is another Target find. Seriously, their Pillowfort section has the cutest baby/toddler/kid stuff. Now that he's born, I've been using this guy as a marker for month-to-month pics. Oh my gosh, I LOVE it! 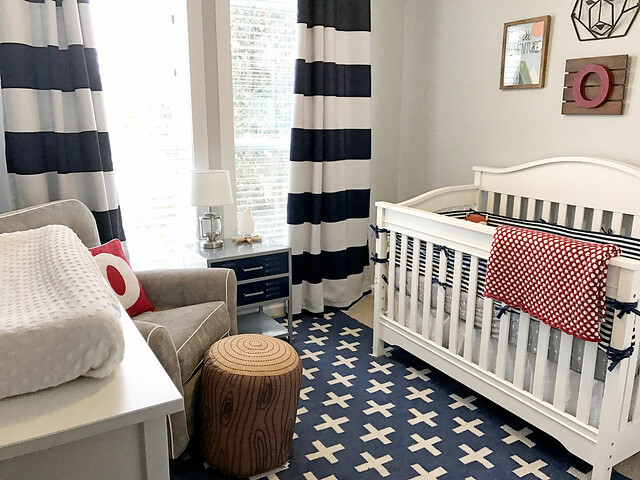 I'm a big fan of baby rooms that look like rooms that grown-ups would want to be in, but with some sweet touches. Also a big fan of Stonington Grey - my mom has used that one before. 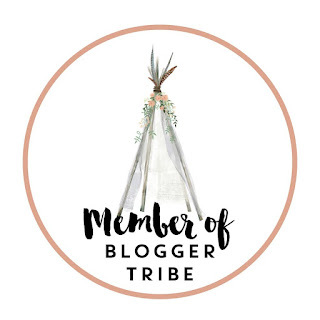 I think you're so good at the graphic prints - love how many you've got going on here, but it still looks so put-together and not crazy, like I'm afraid it would be if I tried it :) Super impressed by your DIYs (that blanket!!) and love all of the sweet details. Glad to know it doesn't look too crazy - I was worried I was going a bit overboard. 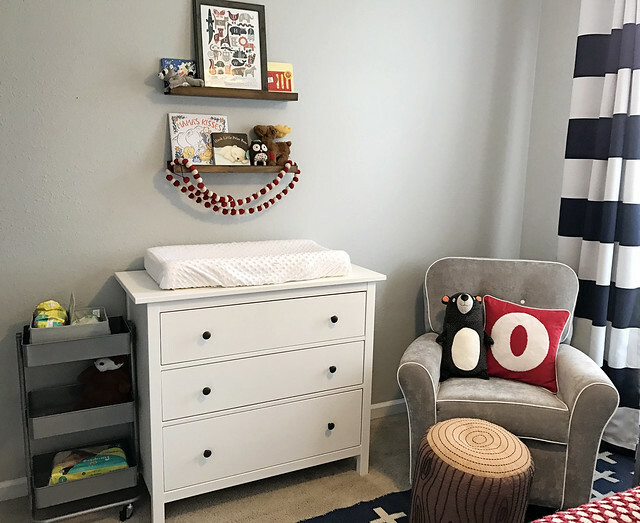 :) My hope is that we can transition this room from baby to toddler without having to do a major overall, so that's one of the reasons I didn't want to go too babyish.